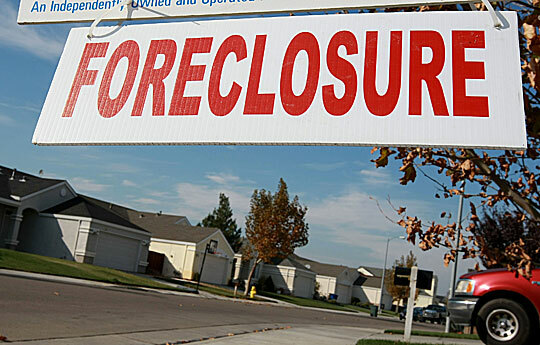 Foreclosures Overwhelm Legal Aid Programs Half of all poor people seeking help to stave off foreclosures "are being turned away at the door," an official with the National Legal Aid & Defender Association estimates. The programs, which offer free or low-cost counsel, don't have enough staff to meet demand. Legal aid attorneys can't meet the demands created by the housing crisis. Foreclosure signs have been cropping up around the country, as with this one spotted in August in Richmond, Calif.
Legal aid attorneys say some people being kicked out of their homes might have been able to stay if they'd had legal help — help that isn't there for everyone. Sarah Bolling is an attorney with the Atlanta Legal Aid Society. Her 71-year-old client, Jenny McCaslin, bought a house more than 30 years ago. McCaslin raised her children there. Now it's falling apart. "Some of the drywall is cracked," Bolling says. "In her bedroom, you can almost see through to the outside." When it rains, water comes into the house. The siding is peeling off. "There was basically a contractor who knocked on her door and said, 'We can do repairs for you; we can arrange the financing,'" Bolling says. The contractor worked for a mortgage broker who refinanced the house three times. The last mortgage was for more than $100,000, though McCaslin's home was appraised at $60,000. The contractor sent repairmen who did shoddy work. When they left, McCaslin's home was still leaking. Only now, she was getting more than $1,000 a month in bills. Her monthly income is only $815. "I didn't want them to take this house from me, because my husband bought this house and paid for it before he was deceased," McCaslin says. Her son had told her about legal aid, where low-income families can find free legal help. At Atlanta's legal aid offices, McCaslin met Bolling, who negotiated with the lender on McCaslin's behalf. "The lender ended up taking $17,000 in full satisfaction of this loan because of our effort with Miss McCaslin," Bolling says. The legal team also arranged to have repairs done on McCaslin's house. For McCaslin, the story has a happy ending. For many others like her, there is no legal help. "We are definitely not helping everybody," says Nan Heald, director of Pine Tree Legal Assistance. The program offers low-income Maine residents free legal services for non-criminal matters. "We have seen both a tremendous increase in court filings and a tremendous increase in demand for our services." Heald says Pine Tree's foreclosure caseload has doubled each year since 2006. Its budget has not. In fact, Heald studied court filings and realized her staff was only involved in about 10 percent of the total foreclosure filings in Maine. Nationally, "half the people coming to the office at least are being turned away at the door," says Don Saunders, director of civil legal services at the National Legal Aid & Defender Association. That statistic does not count those who never make it to legal aid offices. "The other side has a lawyer," Saunders says. 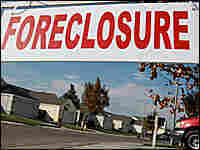 "The bank and the foreclosure process is being brought by a lawyer, and the playing field is clearly not a level one." Saunders believes that greater involvement of lawyers in the foreclosure process might make the system less expensive and more streamlined. "Kicking a family out onto the street is not an easy or simple thing to do," Saunders says. "One lawyer negotiating with a bank might actually save time and save money." Kicking people out onto the street has its own ripple effects. "You're taking people who could be active members of a community, and they're disappearing from that community," says Karen Sargeant, vice president for programs and compliance at the Legal Services Corp. The government office funds legal aid programs. Legal aid attorneys say the situation is frustrating. Everyone suffers when people lose their homes. Lawyers can keep people from losing their homes. But there simply isn't enough money for everyone to have a lawyer. "That's it in a nutshell. Absolutely," Sargeant says. She says her secret to keep from feeling overwhelmed is to "celebrate the successes you have."